In many ways, Stella Glow is a by-the-numbers strategy RPG, but it does have a partially interesting cast, some unique storylines, and a working combat system. Imageepoch has had some ups and downs in their lengthy career, but thankfully they can at least end on somewhat of a high note. As Imageepoch's swan song, it may not be a slam dunk, but it's clear that Stella Glow was crafted with care from people who know the genre, even if at times you just have to stare at whatever just happened in disbelief and say, "Okay, whatever, game." Unoriginal yet competent, Stella Glow is your typical japanese SRPG with added fashion-witches. Stella Glow does a lot of things well, but it also has annoyances that hold it back from being an easy recommendation on the 3DS to any SRPG fan. Stella Glow isn't reinventing the wheel here, but to its benefit it's not trying to. It's trying to be a fun, engaging, and relatively brief tactical J-RPG that signs the end of Imageepoch's tenor with a franchise they started. The story is anime-solid. The combat and social mini-games are enjoyable, and what few irritants the game does have are easily bested by any invested role-playing gamer. Stella Glow has a talent for keeping you engaged all the way through, which is a rare trait for the increasingly niche world of Japanese Role Playing games. While the story is a bit too predictable for my tastes, everything from the visuals to the combat felt very polished from beginning to end. It's quite unfortunate that this is likely the last game Imageepoch will release, but perhaps they will rest well knowing that they went out on a high note. All this cannot save it from being covered head to toe in the usual JRPG clichés, with flat uninteresting characters and very a predictable plot. Had these structural issues been addressed, Stella Glow could be a landmark in the 3DS catalogue. Instead, it's held down to being just a good game which doesn't fulfill its true potential. Stella Glow is a good strategy game for the 3DS that I can easily recommend for those whose enjoy the genre or are fans of the game's developer. However, it is far from a perfect experience. The frequent use of cliches, the lack of speed, and few difficulty options alongside other flaws keep Imageepoch's latest work from being a memorable experience. A fitting swan song for imageepoch and another gem in the 3DS' legendary RPG lineup, Stella Glow is smart, stylish, and seriously satisfying. Fans of SRPGs will get a kick out of the combat, characters, and strategy, the fun, fast-paced story will keep you entertained to the end, and the musical motif works wonderfully, winding its way through the gameplay and presentation with ease. A few interface wobbles keep it from being a totally perfect show, but they're minor concerns in an otherwise spellbinding performance. Stella Glow is absolutely worth singing about. A great year for strategy role-playing games continues with Stella Glow, wherein a surprisingly dark story and entertaining battle mechanics combine to keep players hooked. Overall, Stella Glow represents a polished rendition of the classic strategy JRPG that fans of the genre can appreciate. It doesn't introduce any groundbreaking mechanics but the mechanics it does have are mostly implemented well and make the game enjoyable. 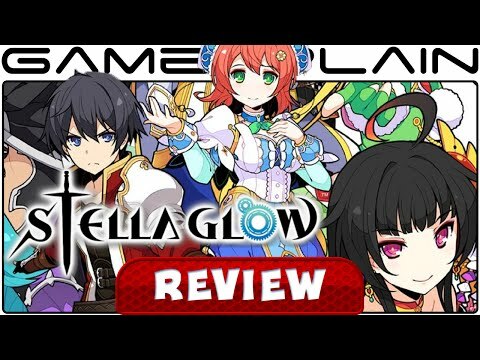 Despite a few issues with character imbalances and tuning sequences that aren't quite dialed down, Stella Glow does a good job overall of providing a modern rendition of the classic JRPG playstyle and should entertain old-school fans. Even with those complaints though, Stella Glow is an awesome game if you like JRPGs. It has almost everything one could ask for: a lovable cast of characters, solid voice acting and music, a moving story, sharp anime stylings and most importantly, deep, satisfying game-play. As a new IP, I honestly thought Stella Glow would leave me wanting and with a list of improvements to be made in the sequel. Instead it left me surprised with how good it was, elated, and very hopeful for a Stella Glow 2. This narrative isn't the most enticing, but it's a serviceable story that will keep players intrigued from beginning to end. Stella Glow may fail the Bechdel Test with flying colors, but its battles provide hours of fun. It's a shame that the developer of Stella Glow had to close on such a middling tactical RPG, and don't have a chance to really put much out there that can shine. This sort of game could tick the right boxes if you're looking for another strategy game to pass the time until Fire Emblem Fates comes out in Europe. Though if you're rather picky about these sorts of games, then it's probably best to wait for something better to come along. Needless to say, I had a ball with Stella Glow. From the opening moments in Mithra Village the game had me hooked to it's satisfying story, rich characters, and rewarding strategic gameplay. That writing this review is the only thing keeping me from continuing my adventures with the 9th Regiment is perhaps the best way I can convey the utter delight I feel while playing. While the knowledge that the company that brought this game to life are defunct is sobering, at the very least the team at Imageepoch got to say goodbye with a fantastic effort. Who would have though witches and upbeat pop music could be such a winning combination? Stella Glow is a good Strategy-RPG that doesn't do anything to push the genre forward, partially because the genre is already so forward to begin with. For fans of anime, J-Pop or Strategy role-playing in general, the game is definitely worth checking out. The game packs plenty of content as it can take you between 30-50 hours to finish, depending on how much you like to grind. Even on a system with as many great RPGs as the 3DS, Stella Glow stands out as one of the very best titles on offer. Stella Glow is a solid, old-school SRPG experience that will delight those who enjoy Fire Emblem, Final Fantasy Tactics, or any of the other turn-based strategy games of the Japanese flavor that have come along in the last few decades.